TimeTrak is a powerful job management solution that offers you the flexibility of giving your customers access to view their tasks. 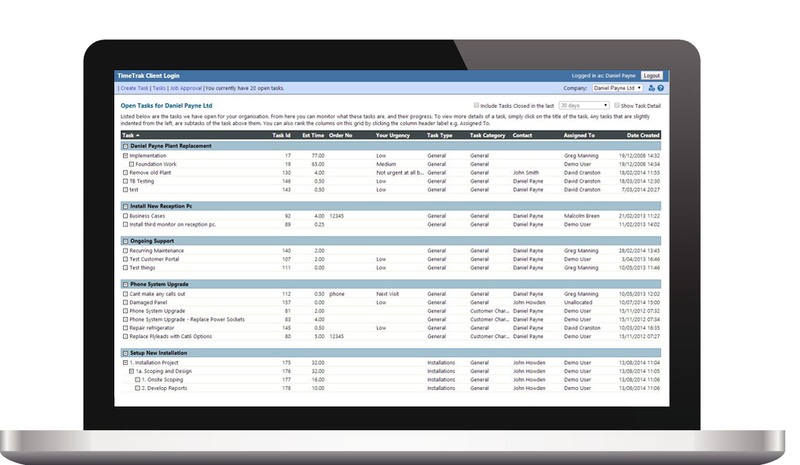 TimeTrak gives your customers access to review, query, close and log jobs - streamlining your relationship with them. TimeTrak provides you with an interface for your clients to access and view task information, which can be added, viewed and queried. Allows your customers to review, query, close, create and attach information to jobs, reducing the amount of time and frustration caused. TimeTrak is a powerful job management solution that offers you the flexibility of giving your customers access to view their jobs. You are able to give different customer types different visibility rules, meaning you can control the type or amount of information your clients can view.